This plaid shirt is a bold black and dark blue plaid. It’s got the plaid diagonal on the pockets and shoulders, and does up with snaps. In Dead in the Water (1x03), Sam starts wearing this plaid shirt after the second death (boy drowning in the sink), and for the dramatic rescue, but takes it off before the goodbye scene at the end of the episode. In Route 666 (1x13), Sam starts wearing this shirt after the third death of the episode (after Dean sleeps with Cassie). He keeps it on throughout the main action of the episode, but changes before the goodbye scene. In Dead Man’s Blood (1x19), Sam wears it for the entire episode (even when he is sleeping), except for the very final scene, when his Dad says they can work together to kill the demon. 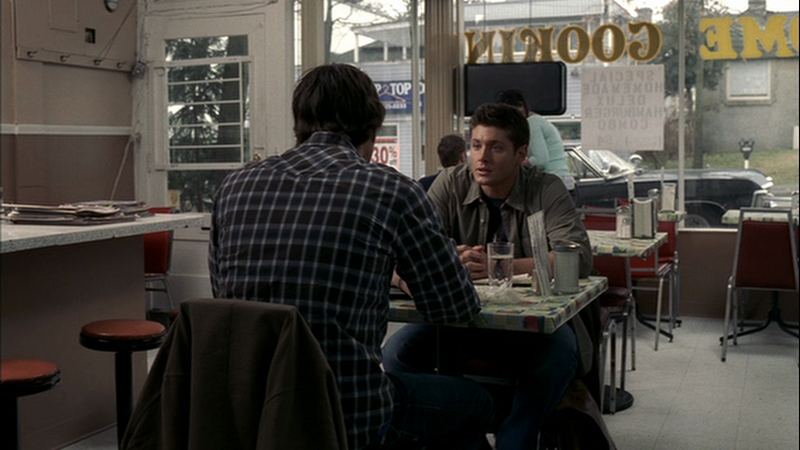 In The Usual Suspects (2x07), Sam wears it for the entire episode, EXCEPT in the scene where he and Dean are at the coffee shop when Dean finds the odd death in the newspaper. In Changing Channels (5x08), Sam wears it when he comes back to the motel to report on the Hulk-sized hole in the front door and the candy-wrappers. He keeps it one when they go to hunt down the Trickster, but then gets changed into different clothes when they are thrust into “TV land.” He is wearing it again when Dean and he believe they have been released from “TV Land” and successfully killed the Trickster. In Like A Virgin (6x11), Sam wears is wearing this shirt when Dean returns from Dr. Visjak with the sword. He wears it until they rescue the virgins. In Freaks and Geeks (8x18), Sam wears this shirt from the beginning of the episode until Victor dispatches himself. 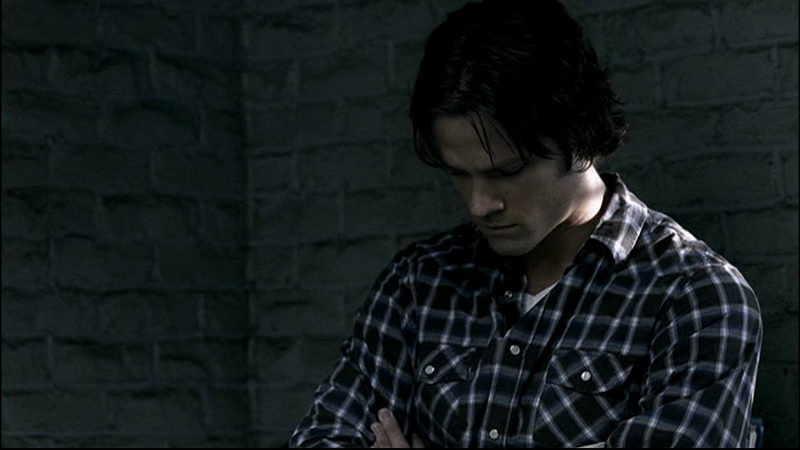 In Plush (11x07), Sam wears it at the beginning of the episode, when he’s in the Bunker. I noticed it too! I think it's the first time he wore it this season - but I could be wrong. I love this shirt. It's his longest running article of clothing, I think. Especially notable because it still fit after he got so many muscels! I noticed this shirt this morning when I was watching Dead Man's Blood on TNT and thought then that I had seen that shirt MAN other times before! Thanks for sharing and pointing that out! Yes, I love that too. This is actually one of my favourite shirts, because Sam has had it so long (and also because it's very easy for me to recognize). Haha, yes, it's like the arguments about what colour Dean's hair is. What's the brand on the top one? Top one too? Cool! I couldn't see the label and it looked different.